Discussion in 'Magazines' started by StrikeTwoPoses, Jan 30, 2019. ForTheImage, guimon, Morgane07 and 1 other person like this. I think it's a lovely cover. I look forward to seeing the content. I like her expression; a refreshing change from the all too common sultry/seductive or bored look. She ages so well, her skin is amazing. Ugly cover, ugly styling, she looks too clownish. I never found her orange hair attractive. I’m not really sure about this. The styling and hair/makeup are too matchy-matchy to me. Red and pink for a redhead like Karen Elson? Groundbreaking. Cute cover, happy for Vogue Brasil to be producing great covers. Oh wow I'm in love with this. Karen is simply divine and I am living for the vibes on this cover. Beautiful beautiful beautiful! I love Karen Elson and I usually really enjoy Zee Nunes' work. 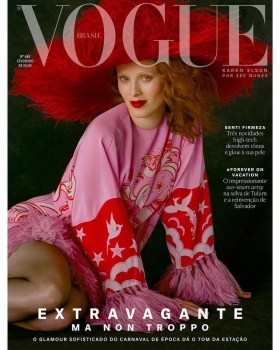 Together on this cover, though, this doesn't say Vogue Brazil. And it's not really inspiring. Kind of.... meh? Love this! This is so "not Vogue Brasil", but in the best meaning of the sentence. I'm waiting to see a bad photo of her. She is just an amazing model. This is so super tacky and awful. It's not really for me. The colours really work for her, but the witting pose looks awkward and that look is a bit difficult to digest. It reminds me a lot of Joan Small's cover from June 2017. The pose, the hair...idk maybe its just me but they seem kind of similar. I love Karen. I like this cover.